Next time you're staying in a hotel, stop by the brochure rack in the lobby. Among the brochures for tours, cool attractions, natural wonders, amusement parks, local restaurants, and historical sites, you might find a slightly out-of-place brochure; one that speaks of elegance, high class, and exclusivity. In the brochure rack you'll be hard pressed to find a brochure as well designed and beautifully produced as this one. DePuy Spring Creek is one of the finest wild trout streams anywhere in the lower 48 states. Located 6 miles outside of Livingston, Montana, the original gateway to Yellowstone National Park, millions of park visitors stay in hotels within close driving distance to the spring each year. DePuy Spring Creek, LLC, offers reserved fly fishing spots on this world-class trout fishery. This brochure needs to appeal to fly fishers who may have an open day or two during their visit. These potential customers typically have some disposable income and occasionally enjoy dining at a fine restaurant. 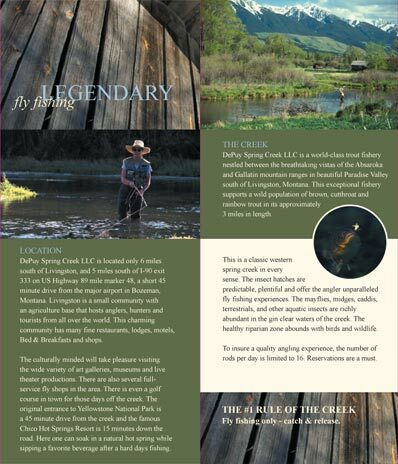 To appeal to the target audience of this brochure, the whole piece has to say, "Epic Fly Fishing!" Professional photography - The best way to appeal to this audience is to put a big, giant trout right on the front cover. Actually, the photographer did one better and shot an image of a big, giant trout just coming out of the water with a fly in its lip. Appealing "inside" information - Not everyone would find a license plate splattered with bugs exciting. But to the right person, this means big fish. 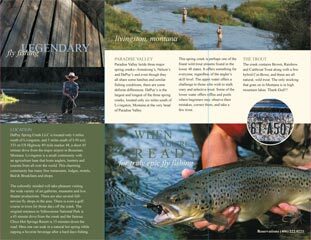 The bug smeared license plate photo on the inside of the tri-fold tells a fly fisherman that the driver just went through a caddis fly hatch - a favorite food of trout. This photo cleverly sends a "coded" message to the right audience. Font and Leading - A serif font was used with slightly expanded spacing between letters to give a clean, easy-to-read feel. Sarif fonts are good to use on brochures built around a nature theme. The font style has a more classic, old world finish and fits right in on this piece. Paper - An 80# gloss text was used to provide the right finish to the piece. Nature is heavily represented in this brochure, and there are many design elements that were integrated to help accentuate those natural elements and leave the reader with warm feelings. Format - Since this piece was designed for display racks in hotels, chambers of commerce, rest stops, visitor centers, and the like, this brochure had to be an 8 ½ x 11 tri-fold to fit in display racks. Contact info - You don't want your contact info placed too inconspicuously on your brochure, but you also don't want to detract from the piece. The designers here did a good job subtly placing a contact number on the inside of the tri-fold, and wisely using the center of the back fold to place the company's full contact information. Due to the target market and nature of the product, it was necessary to put pricing on this brochure. Here it was placed very appropriately on the back panel. Excellent professional photography, a clean crisp feel, and a very warm, natural appeal make this elegant brochure really stand out. Look for it next time your travels take you near Yellowstone National Park.